From left: Robert Matiru (UNITAID), Khuat Thi Hai Oanh (Supporting Community Development Initiatives), Peter Sands (Global Fund), David Sergeenko (Government of Georgia), JVR Prasada Rao (Global Commission on HIV and the Law). Photo: Charlie Baran. 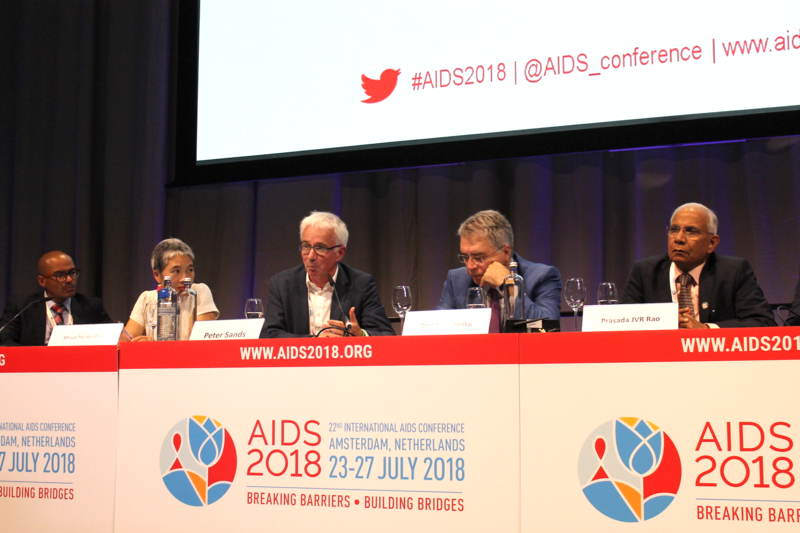 The high-level session, which took place directly before the opening ceremony of the conference on Monday, 23 July, encapsulated well one of the major themes of the conference, as noted in GFO 340, that the success of the global HIV response will be tied closely to the success of UHC. Dr. Tedros was followed by three presenters with more country-level perspectives, coming from South Africa, India, and Georgia. The first was Aaron Motsoaledi, South Africa’s Health Minister. Mr. Motsoaledi remarked that, “The concept of UHC has arrived at the right time.” He described how South Africa, which has the largest HIV epidemic on earth, functionally has two parallel health systems. “A private one which is superior to any in Europe. And a public one which, just like any other in Africa, is marred by huge inequalities.” From his perspective, the drive for UHC will help diminish the disparity between his country’s health systems. The next speaker, JVR Prasada Rao of India, continued on Mr. Motsoaledi’s theme of two health systems. According to Mr. Rao, a commissioner with the Global Commission on HIV and the Law, “UHC doesn’t include the private sector.” He appeared to be referring to the fact that the global UHC movement is largely led by governments, NGOs, civil society, and multi-lateral institutions, but does not yet have strong engagement from business or the private sector. This is a problem for Mr. Rao because in India 60% of health services are accessed through the private sector. He described a situation where, just as in South Africa, people who are more privileged have access to the private health system, which offers better quality care, while others are left to suffer the public health system. The distinction itself can inhibit access to services. As Mr. Rao described, “In some developing countries the health system itself is an instrument of stigma for poor people.” Shrinking the gulf between the two will be critical, according to Mr. Rao. Georgia’s Minister of Internally Displaced Persons from Occupied Territories, Labor, Health, and Social Affairs, Dr. David Sergeenko, spoke next. Universal health coverage is the national policy of Georgia, having been initiated in 2012 and operational since 2013. Dr. Sergeenko allowed that while his country is fairly small, it is nonetheless a great example for other countries to study. While most of his remarks focused on his country’s efforts to control hepatitis C virus (HCV) and HIV, he was able to point to some of the overall benefits of UHC. 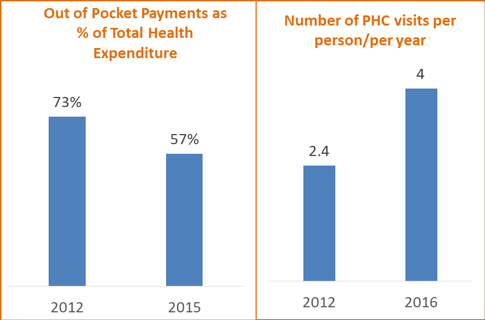 For example, since 2012, out-of-pocket payments by patients, as a proportion of total health expenditures, have gone down significantly, just as patient visits to public health centers have nearly doubled, signaling more well-visits and treatment-visits, two key indicators of improving health outcomes (see Figure 1). Figure 1. Universal health care program, Georgia; out-of-pocket expenses. While the Global Fund Board – not the Executive Director – sets Global Fund policy, Mr. Sands’ comments in this session and elsewhere do suggest that he would support such a policy at the Fund.